I love clawfoot bathtubs! They’re known for their classic look, but I’ve always thought they were underrated for functionality. They offer an amazing bath experience, but can still be readily converted and used as a stand-up shower as well. 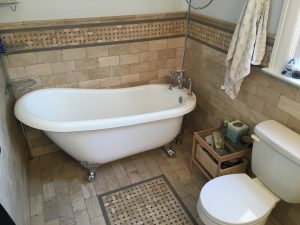 Some of the smallest bathroom projects make for the biggest impact, starting with a small-scale bathroom addition. 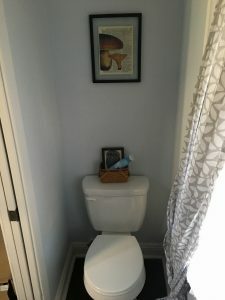 In certain home designs and floor plans, it’s more feasible than you might think to turn a storage closet into a water closet toilet. Adding a half-bath to your home makes a reliable and sizable impact to your home’s value. Some projects are about functionality and aesthetics. 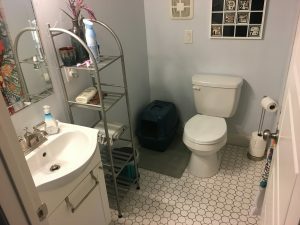 This new tile floor, combined with budget hardware choices created a functional space for both the homeowner and her cats to be able to use the same bathroom space. 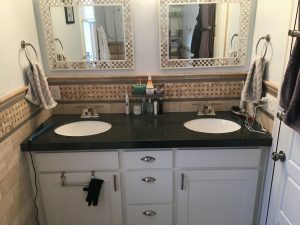 Double sink, double mirror, His and Her bathroom. One of the big design choices I’ve always hemmed and hawed about when a homeowner would ask is the square vs. oval sink inserts. Square sinks seem to be holding their popularity, but there’s still nothing wrong with oval.